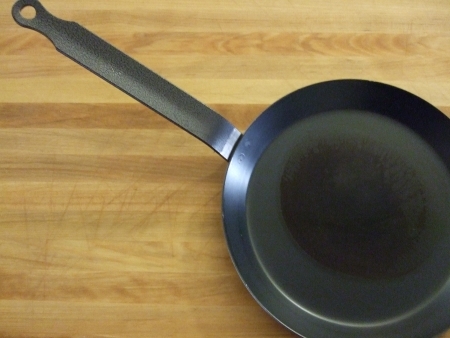 Questions about the safety of Teflon-coated nonstick cookware come up pretty regularly. It seems that the pans have allegedly caused deaths in birds and flu-like symptoms in humans (Tugend, Alina. “SHORTCUTS; Teflon Is Great for Politicians, but Is It Safe for Regular People?” The New York Times. October 14, 2006.). The official word from DuPont, the FDA, and the EPA is that they’re generally considered safe when used within recommended guidelines. That includes not heating an empty pan, generally cooking over low or medium heat (up to 450°F or 500°F depending on the manufacturer) and avoiding using metal or sharp-edged utensils that can scratch the coating. Seems reasonable, for the most part, though a good sear can depend on high heat and it’d be nice to be able to stick them under the broiler without fearing for the safety of nearby birds. There are plenty of people convinced Teflon will kill you or give you cancer or migraines or something. I’m not in their camp, I’m just not convinced that most nonstick pans work all that well. I find they have a tendency to get gummy when used with nonstick sprays, and when that happens they can be tougher to get clean than their conventional counterparts. With heavy use their nonstick properties seem to diminish, and they need to be replaced more frequently than conventional cookware. I’m simply not convinced that they have much of an advantage over alternatives that don’t share their questionable safety record. Cast iron is one alternative. When cast iron is well-seasoned, it releases food easily and lasts forever. Enamel-coated cast iron allows you to skip seasoning the pan and is nonreactive, so you can cook tomatoes and other acidic foods in them without risking any off flavors or colors. Woks are another option. Often made of cast iron or carbon steel, they also require seasoning and release food with minimal effort. The carbon steel ones are lighter, and obviously excellent for stir-frying and any light sauteing. Round woks can wobble on Western gas stoves and don’t really work on flat electric ranges, but flat bottomed woks sidestep that problem. I’ve recently discover another option I can add to the list, a blue steel crepe pan. I would never have thought a crepe pan was worth owning. It seemed like a single-tasker, and I don’t make crepes often enough to warrant owning such a specialized item, but this little pan–only 7 and 7/8 inches (20 centimeters) in diameter–has proved to be a versatile compliment to my other cookware. It is small, light weight, and easily maneuverable. It works well for crepes, of course, and their American cousin, the pancake. I haven’t quite mastered the art of hoisting and flipping a pancake in the pan with a flick of my wrist, but this pan is light enough that I won’t hurt myself trying. It has become my go-to pan for eggs. Small omelets, made with two or three eggs, fit perfectly. It is also oven and broiler-safe, making it ideal for individual frittatas that tend to spread thin in a larger pan. It heats quickly and works well for toasting spices or nuts or sauteing anything in small quantities. Its low sides grant a spatula easy access. It also bears a remarkable resemblance to Indian pans used for making flat breads such as dosas, chapatis, and rotis, all of which I’d like to try my hand at at some point. It does need to be seasoned–I had good luck following these directions on how to do that. Tradition dictates that it be wiped out with salt rather than washed with soap and water. I’ve washed it gently with a small amount of soap to no ill consequence. It does need to be dried immediately and thoroughly to avoid rust. At only $15, it’s quite a bargain. I’d highly recommend it to anyone looking for alternatives to Teflon or an affordable, long lasting, little pan with loads of old-world charm.